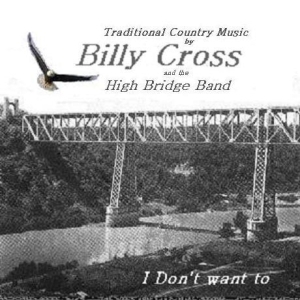 The High Bridge Band was formed in September of 2008 by Vocalist and guitar player Billy Cross and Robert Hall. Billy learned to play guitar at the age of eight and was writing his own songs by the age of thirteen. He has always had a love for traditional country music. Robert started his love affair of music at the age of five, learning to play the keys and then guitar at age fifteen. When Billy and Robert met in early 2008, it was as though they were ment to always play music together. Thier skills and friendship has helped them create new, but traditional style country music together. ""I Don't Want To"" CD release date: Sept. 2009 Recorded @ Trebor Home Studios Lancaster, KY The CD is grounded in traditional country with other genres such as the blues and bluegrass influences. Copyright © 2009 - 2010 Billy Cross and the High Bridge Band. Recorded @ Trebor Home Studios Lancaster, KY. The CD is grounded in traditional country with other genres such as the blues and bluegrass influences. * Your song 'I Dont Want To Love You (but I still do)' has just been added to THE SAD SONGS station! * Your song 'Conscience' has just been added to WHERE THE MIGHTY RIVERS MEET station! * Your song 'Conscience' has just been added to COUNTRY COOKIN' station! * Your song 'I Dont Want To Love You (but I still do)' has just been added to WHERE THE MIGHTY RIVERS MEET station! * Your song 'Brand New Friend' has just been added to LEGENDARY COUNTRY MUSIC station! * Your song 'Conscience' has just been added to Airport station! * Your song 'Brand New Friend' has just been added to Get Down Music Nashville station! * Your song 'Maybe I Can Let You Go Again' has just been added to Get Down Music Nashville station! IAC Your song 'No Place to Fall Apart' has just been added to XNWY Kickinghorse Country Radio station! Début CD - ""I Don't Want To""
recorded @ Trebor Home Studios. Lancaster, KY.
IAC VIDS ON U-TUBE Collection of videos from IAC artist.